Today I’m sharing some of my favorite products for glue application. 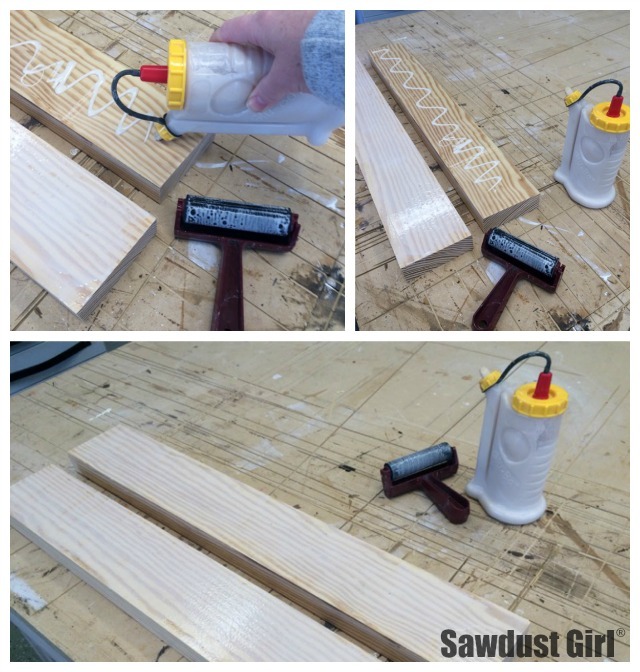 These awesome, glue tools are inexpensive products that make glue-ups a breeze! These products were made specifically for applying and spreading glue. First up is the Glue-bot. The Glue-bot comes in 16 oz and 4 oz size. I ordered a two pack for $15.00. I use different bottles for different glue. This bottle has different tips you can put in to apply different amounts of glue though I just put the one tip in it and use that for everything. The cap doesn’t clog like the bottle the glue comes in. Also, because of the design, I can hold the bottle upright and squeeze glue out. This is great for applying glue to the cabinet ends before attaching a face-frame. Once I get the glue onto the wood, I need a way to spread it out. This Speedball Hard rubber brayer works awesome as a glue roller! 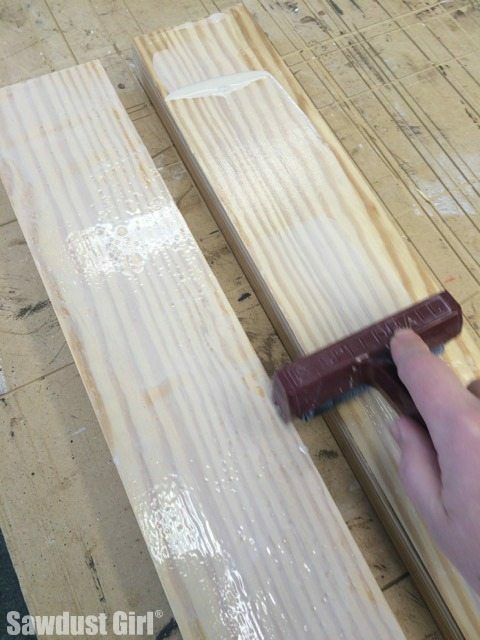 Just squeeze some glue onto my lumber and roll it out to get complete coverage. Then wipe it off with a wet rag or plop it into a bucket of water until you need it again. Just don’t let the glue dry on the roller. Glue doesn’t peel off the rubber like it does on silicone. Then we have silicon bowls. These are pinch bowls meant for the kitchen but they are awesome when you need to apply glue with a small applicator into holes of some sort. Any leftover glue, you can let dry and then bend the bowl and peel the dry glue right out. A good example of when the silicone bowls are handy is when applying glue into the mortises and onto loose tenons. For that job, I use this Glue Brush. It holds a good amount of glue, has a flat end and the brush end so it’s quite versatile. A quick rinse in water when done cleans the glue brush easily so it’s ready for use again next time. I keep all my glue tools in one handy spot so I can find them when I need them. Sarah I use primarily Titebond wood glue. I use Titebond 3 (greed) when I need time to make sure everything is in place before the glue starts to set. I use Titebond original (red) when I don’t need an extended open time. There are TONS of different kinds of glue — but I just mainly use those two. These are great! Gluing is honestly very frustrating for me – there’s a lot of ways it can go wrong. Hopefully these ideas will make things a lot simpler for me! Thanks so much! !